While solid-state LiDARs are hardly visible in cars and are cheaper, the discrepancy between the more expensive LiDARs' less-than-seemly appearance and the commercial appeal they hold among OEMs can be explained by the devices' scanning power. Among other things, these devices are able to make 360-degree scanning sweeps around the car as it drives, while feeding that visual data into the car's neural network computer system. Conversely, solid-state LiDARs are limited in scope to below 90-degree optical scans and must be embedded in the front and back bumpers of cars, in order to achieve a comprehensive view of the surroundings. In this way, there are four devices embedded in the car with two on each bumper. Solid-state devices also require extra software to manage the four separate data streams from the four devices. The technology advantage is the main reason why Argo AI, Cruise Automation, Ford, Lyft, Uber, and possibly Waymo should continue to use this more expensive LiDAR technology when their self-drive models become available in commercial ride-hailing fleets, according to analyst firm Frost & Sullivan. Cost is also certainly a consideration, but while LiDARs once cost tens of thousands of dollars, the devices, like the kinds that Velodyne and Valeo sell, now costs about $6,000 to $7,000 per unit. 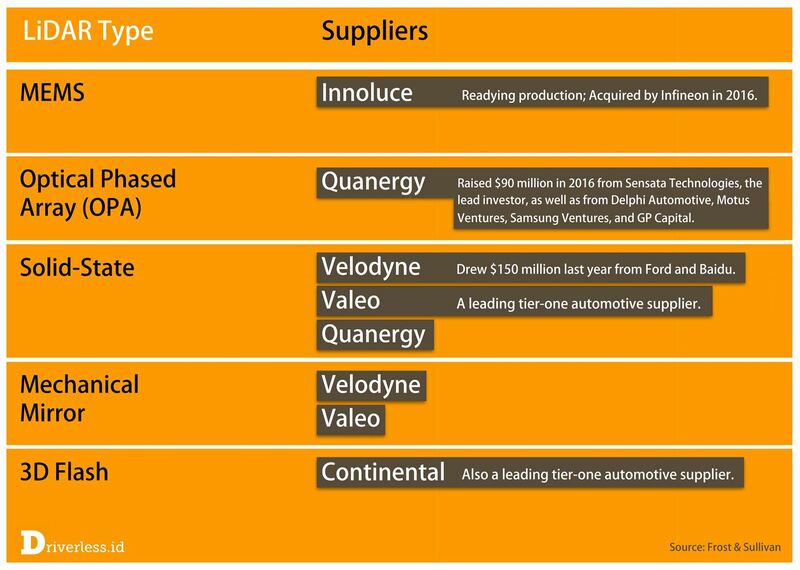 The price point is certainly much steeper than solid-state LiDARs, which Velodyne, Valeo, and Quanergy make. Quanergy, for example, is readying production of its S3 at $250 price point, which the company is touting as the "world's first" affordable solid-state LiDAR. 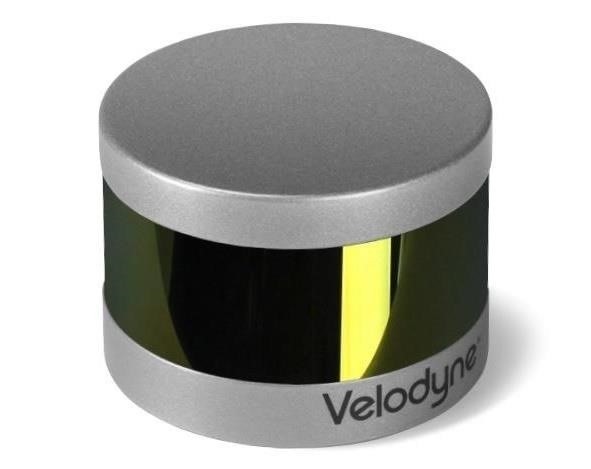 However, the steep price point for Velodyne's multi-beam spinning LiDAR sensors and Valeo's mechanical mirror sensors doesn't matter as much. This is because they are expected to be deployed in a limited number of commercial fleet services they become available commercially during the next three to four years. A ride-sharing firm such as Uber or Lyft, for example, is expected to only deploy only a few thousand cars in driverless fleets when the services become available commercially, according to Frost & Sullivan data. Paying $6,000 to $7,000 per unit for a LiDAR device per car is thus less of a burden for fleets than for retail sales of over 100,000 units per year. This is why, in volume sales, solid-state LiDARs are expected to represent the vast majority of sales as cars with Level 2 and Level 3 driving features increasingly become commercially available, Anirudh Venkitaraman, an autonomous driving analyst for Frost & Sullivan, told Driverless. The extra cost for the OEM doesn't really matter. As a rider, when you hail a car as part of a ride-hailing service, you don't care that much when you're riding in the backseat if there is a large LiDAR device on top of the car. That won't be a problem for a lot of consumers out there. Velodyne's new VLP-16's puck-like shape is even cool to look at. Still, while seeing one on the roof of a driverless Uber car you might hail probably won't matter much, you may loathe seeing an unwieldy device on top of a car you paid over $40,000 to own. LiDAR's different form factors will thus fit the needs of different business models, Bill Rinna, an analyst for LMC Automotive, told Driverless. You have to look at the reasons for purchase for both mobility models, which are far different when comparing a consumer retail vehicle purchase and the use of ride-sharing. Whereas, exterior design ranks high for new retail purchases, factors like availability, comfort and safety tend to drive ride-sharing purchases. So, while not ideal aesthetically, I don't believe it would be an impact to ride-sharing usage. It could turn out that advances in solid-state LiDARs enable them to begin blasting 360-degree scans like these more advanced LiDAR devices do one day. But when you begin to hail a driverless car from a ride-sharing firm in just a coupe of years, you'll probably find that unsightly dome on the top of the car for the reason described above. It probably won't make much of a differ to you either, but for the thousands of engineers slaving away at developing driverless cars today, mechanical mirror LiDAR's scanning features obviously matter a lot.